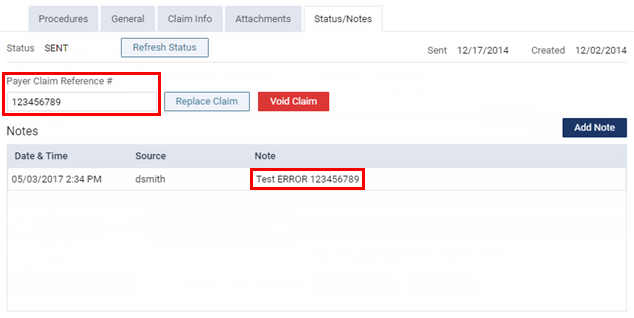 You can resubmit a claim that has been rejected by an insurance company due to incorrect or missing required attachments and/or due to missing or insufficient data. A claim that needs to be resubmitted has a status of Rejected by eServices (REJECTSV), Rejected by Payer (REJECTED), Unprocessable Claim (UNPROCESS), Additional Information Requested (ADDINFO), or NEA Error (NEAERROR). Tip: You can access rejected claims from the Unresolved Claims box on the practice Overview page (dashboard). If the claim has missing or insufficient data only (the attachments are fine), enter the original reference number, change any other claim information, and resubmit the claim. 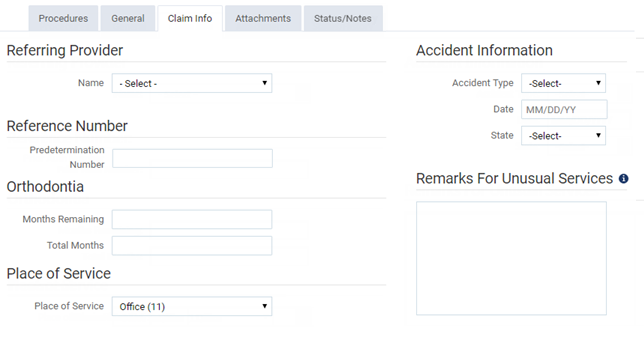 On the Status/History tab, locate the reason that the claim was rejected (it may be identified by a Document Control Number, DCN, or Claim Reference Number) within the Note of an entry in the status history list. Copy and paste the reference number (from step a) into the Original Ref Number field. If the claim has missing or insufficient data and has incorrect or missing required attachments, enter the original reference number, enter the attachment reference number, change any other claim information, and then resubmit the claim. Copy and paste or type the reference number (from step a) into the Original Ref Number field. Also, on the Status/History tab, locate and copy the attachment reference number (it may be identified by a DCN) in the status update history list. On the Claim Info tab, make the necessary changes. On the Attachments tab, add or correct the attachments, and type or paste in the Attachment Ref Number (from step c). If the claim has incorrect or missing required attachments only (the other data is fine), to send or resend the correct attachments directly to NEA (National Electronic Attachments) without resubmitting the entire claim, enter the attachment reference number, and then resubmit the attachments. On the Status/History tab, locate and copy the attachment reference number (it may be identified by a DCN) within the Note of an entry in the status history list. On the Attachments tab, add or correct the attachments. Type or paste in the Attachment Ref Number (from step a). Click (or tap) Submit Attachments. If the payer has requested a replacement claim, to resubmit the claim as a replacement for the original (the claim is routed differently than with a normal resubmission), enter the original reference number, and then replace the claim. On the Status/History tab, locate the original reference number (it may be identified by a DCN) within the Note of an entry in the status history list. Copy and paste or type that reference number (from step a) into the Original Ref Number field. 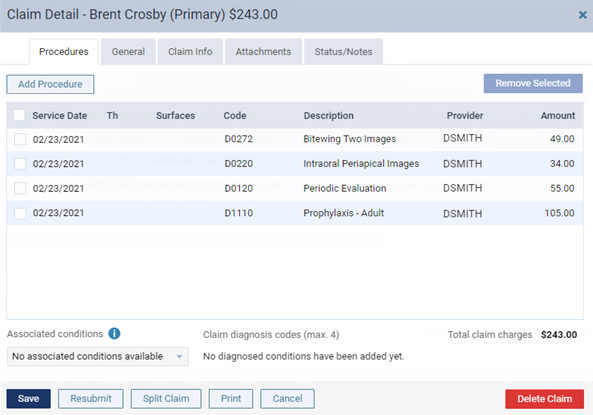 Under Specific Payer Requests, click (or tap) Replace Claim.